Dropcam Pro Internet Wi-Fi Video Monitoring Cameras help you stay connected with what you love, no matter where you are. In less than a minute, you'll have it set up and securely streaming high-definition video to you over your home Wi-Fi. Use it to watch your home, your baby, the dog or your small business. Every camera comes with Night Vision, HD video, Two-Way Talk and Digital Zoom. Paired with secure online Cloud Video Recording (CVR), you can watch live and recorded video from anywhere on any device. Dropcam makes monitoring what you love and finding peace of mind easier than ever. Watch from any device such as your Apple Mac, Windows PC, iPhone, iPad, iPod touch or Android device. 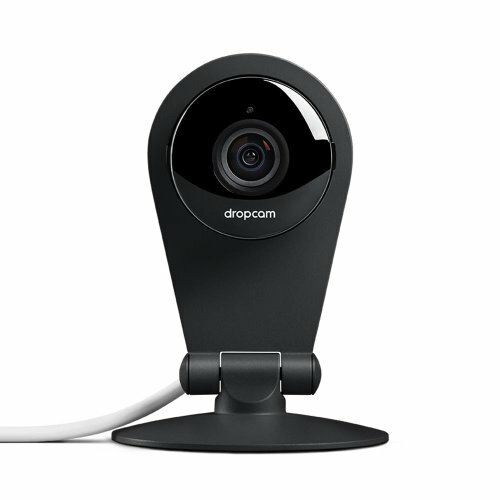 All you need is a Wi-Fi network paired with the free and easy-to-use Dropcam App. Watch what you love while away with Dropcam. Please note: If your camera is having trouble connecting to your Wi-Fi network you may have a weak connection between the camera and your router. To test the Wi-Fi signal that your camera is receiving, To test the Wi-Fi signal that your camera is receiving, move your camera closer to your router. There might be interference coming from other electronic devices near your camera. Try to reduce the number of connected devices near the camera. Cordless phones, baby monitors, microwave ovens, garage door openers and Wi-Fi speakers are just a few of many devices that are notorious for causing interference. If your camera is located close to electronic equipment with a large power source, such as a large screen television or home theater system, try moving the camera further away from these devices. Sometimes only a few feet will make a difference. You can turn HD video off to reduce the bandwidth the camera uses by half. This will help improve the camera's reliability, but it could result in lower video quality. If you have any questions about this product by Nest, contact us by completing and submitting the form below. If you are looking for a specif part number, please include it with your message.